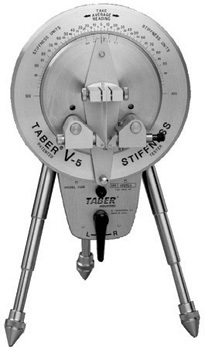 The Taber Stiffness Tester utilizes a two directional pendulum-type weighing system to evaluate material stiffness, flexural strength, resiliency and elasticity properties. Predetermined sample length, deflection angle and rate of loading provide accurate and reproducible test results. Force is applied to the lower end of the specimen by a pair of rollers attached to the driving disc. The resulting torque tilts the pendulum from its vertical position and a Taber Stiffness Unit reading (gcm) is taken when the pendulum mark aligns with the appropriate driving disc mark (7-1/2” or 15°). Nine distinct setups permit the testing of very delicate to extremely rigid materials up to 5.5 mm (0.219 inches) thick. 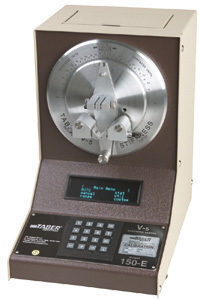 Based on the original Taber Stiffness Tester, Model 150-B requires the user to record stiffness testing data, average the readings and multiply results by a scaling factor. The user manually operates the pendulum deflection by a lever control switch. A dynamic brake holds the pendulum in position enabling the operator to capture the unit scale reading. Mounted on tripod legs, this instrument is lightweight for easy portability. Weight Normal, 15 lbs. Shipping Weight, 26 lbs. A high resolution optical encoder and a non-contacting photo sensor are incorporated to make the Model 150-E fully automatic. The onboard computer automatically calculates and records stiffness testing data (average, standard deviation, high/low, date and a user-defined label), and converts stiffness readings to the appropriate user selected stiffness range. Data can be either printed or downloaded to a PC. Plus, up to 1,000 readings can be stored in non-volatile memory. The instrument also offers the ability to perform testing in auto or manual mode. Weight Normal, 24 lbs. Shipping Weight, 38 lbs. The Taber Triple Cut Specimen Shear will prepare consistent specimens (1-1/2” x 1-1/2” or 1-1/2” x 2-3/4”) for most materials up to 0.020” in thickness. The High Sensitivity Attachment (also referred to as Sensitivity Range Attachment) is used to test the stiffness of extremely lightweight materials. 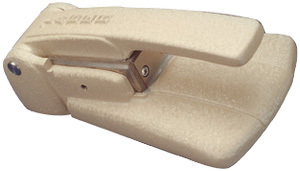 A 1-1/2” x 1-1/2” specimen is mounted between a set of pin holders, which replace the rollers.